Maritime historians and model shipwrights owe a lot to French naval admiral François-Edmond Pâris. He published a number of books in the 19th Century that featured plans, drawings, and even beautiful watercolor paintings of vessels from around the world. He also documented historical ships no longer in existence, but previously recorded by others. La Couronne is an example of this. 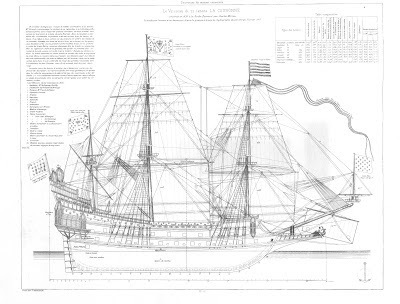 Ships plans for La Couronne, a 17th Century French first rate warship come from Pâris's Souvenirs de Marine Conservés, ou Collection de plans de navires de guerre et de commerce et de bateaux divers de tous les pays tracés par les constructeurs ou marins … recueillis et publiés par l’amiral Pâris. La Couronne (French for “The Crown”) was commissioned into the French Navy in 1636. She was a war galleon built by the French as part of the effort by Cardinal-duc de Richelieu et de Fronsac, King Louis XIII’s chief minister, to ensure the French Navy was dominant on the seas. Built 200 years before the 120-gun French ship of the line Montebello, in La Couronne one can really see the link between early Medieval vessels and the magnificent warships of the golden age of sail. Her massive castellated quarter decks recall the war galleys of the Mediterranean, on which bow and stern "castles" served as battle platforms from the Ancient to Medieval times.